"Also reminds me of the teddy bear in the AI movie, I think Speilberg made awhile back." "Thanks for reminding me. In his 1969 story Super-Toys Last All Summer Long (the basis for Steven Spielberg's A.I. ), writer Brian Aldiss imagines Teddy, a perfect robotic companion for a young boy. And a mother. 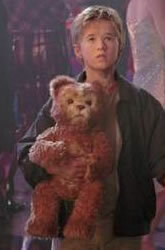 "It also looks a lot like the teddy bear robot from the movie "Screamers". I wonder if you can get the Fujitsu model with lots of long metal fangs?"